In the absence of DNA evidence in a murder trial, prosecutors in Michigan asked the Kent County GIS team to map the location data from cell phones carried by several suspects in the case. The maps, created using Esri ArcGIS, placed the signal of the cell phone that belonged to defendant Karl Cotton Jr. in the neighborhood of the apartment building where Jamie Powell was shot to death. Read the article. 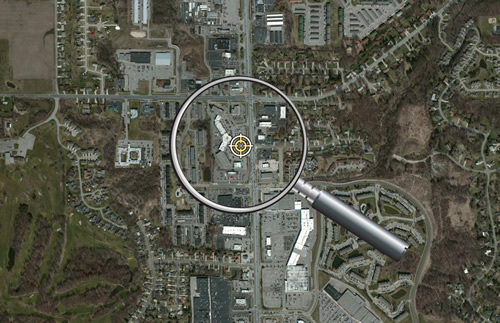 Imagery and GIS maps also played a role in the conviction of a man charged with public indecency. Read the article. 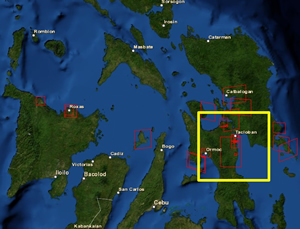 After Typhoon Haiyan struck the Philippines, the US government made a large amount of DigitalGlobe imagery of the damaged area available for free to the public for humanitarian purposes. You can find it on ArcGIS Online. To find out how to work with the imagery in ArcGIS, read this tip. Five days with 15,000 people who, like you, like GIS. That means a lot can happen. See how Esri will get the conversation started on topics such as real-time GIS, web and mobile apps, open data, and big data. Read the article. The QuestionWhere Builder, Profile Builder, and Activity Dashboard apps in ArcGIS Marketplace help you do more with ArcGIS Online, including interacting with your customers and the general public. Read the article. Want to draw a viewshed or elevation profile for a location but need the data? Need to know the slope of a road? Esri's ready-to-use services, powered by ArcGIS Online geoprocessing, can help. Read the blog post. General Motors manager Bruce Wong talks about how his company uses Esri Location Analytics to help dealerships better serve customers. Watch the video. US Army geospatial engineer Jason E. Feser and Lyle Wright from Esri demonstrate the advantages of using map templates for military missions. Watch the video. Learn to manage, analyze, and visualize geospatial data to support intelligence missions. Take the new course Using ArcGIS for Geospatial Intelligence. Maryland governor Martin O'Malley says that GIS helps measure how well government performs. Read the article. See what ArcGIS can do with your data. Watch the video with interviews of people who use the technology to work smarter and faster. Learn to add PowerPoint slides and presentations to your Map Tours. Read the blog post. Use this Esri story map to see real-time data, such as air temperature, wind speed, and stream temperature, from 125 sensors at H. J. Andrews Experimental Forest in Oregon. Read the blog. Where do Americans live today? How close are their neighbors? Where will they move next? These three maps from Esri help to form more complete answers. Audio adds an extra dimension to your map tours: a little storytelling spice. Esri's Bern Szukalski shows you how to add an audio file. His tip: Keep your audio clips short because, like spice in food, just a pinch of audio gives a story flavor. Read the blog. A diorama of the moves made by Roger Federer and Paul-Henri Mathieu during a tennis match was created using Esri's ArcScene and Esri CityEngine web viewer. Read the blog. Developers can start to use Esri Geotrigger Service to add real-time location-based messages to iPhone and Android apps. Read the blog post. See how Kurt Towler from Sulphur Springs Valley Electric Cooperative in Arizona used ArcGIS Online to study the travel costs to destinations crews need to frequently reach. Web GIS is now included with ArcGIS 10.2 for Desktop. Read the article. Esri's Andrew Turner talks about the latest open-source initiatives at Esri. Read his blog post and watch his Dev Chat. See what's been added and improved in the latest version of ArcPad. Read the blog post. Learn to manage security, credit consumption, user access, and more, by taking the new web course Performing ArcGIS Online Administrator Tasks. New contributions were added to the World Topographic Map via Esri's Community Maps Program including the Islands of Bermuda; Idaho State University; and Missouri City, Texas. Read the blog post. Spot the location of sinkholes and track other impacts of the floods in the United Kingdom using these maps developed using Esri technology. Geospatial technology can be used to protect whales. Watch the video. The United States Library of Congress is collecting maps and technical information related to early computer cartography and the history of GIS. Read the article. See what training is right for you. Scroll through the new Esri Course Catalog. An Esri team shows how the ArcGIS platform can help an Olympic team prepare for the big event using the Winter Olympics in Russia to illustrate. See the 2014 Winter Olympics maps. An updated severe-weather map powered by Esri shows where the temperatures are lower than 32 degrees Fahrenheit, where it's expected to rain and snow, and more. See the map in action. View 125 color maps in Mapping the Nation: Supporting Decisions That Govern a People to see how government agencies use GIS. An example: the analysis of elevation changes after Superstorm Sandy. Get the interactive e-book version free on the Esri Bookstore app.